The New York Rangers (31-28-4) last night pulled out an important meeting against the Buffalo Sabres (30-28-4), largely in part to Sean Avery's gritty and relentless performance - his game winning goal in the final five minutes in the third period, ending the contest between two hotly contested Eastern Conference rivals. A goal and an assist reaffirms our knighting Avery a true New York Ranger. Folks, we have ourselves a true Blueshirt -- finally. Re-sign Slats...quickly. Official recap here. What more could we ask for after Black Tuesday, as a 'win' against Buffalo answers the devastating loss to Montreal (we can try and forget that one) and puts a winning face back on the Blueshirts. Though still uneasy, the Blueshirts are on a bit of a roll lately at 9-3-2 in their past 14 games - maintaining their place in the playoffs, but as we all know anything can happen as they are eight points away from first place in the Eastern Conference and three points away from missing the playoffs. 'Cautiously optimistic' is The Dark Ranger's approach to the remainder of the season, while 'Anything Goes' is the operative slogan of this team. Currently the Rangers are tied with Boston in sixth place in the Eastern Conference. Buffalo dropped to eighth, a point ahead of the New York Islanders and Philadelphia. New York's goalkeeper money extraordinaire, 'Pauper' Henrik Lundqvist made some terrific saves and gave up some pedestrian goals. It was a mediocre performance at best and hopefully this evening we will see Stephen Valiquette take the net. Hank's nerves looked to carry over from this week's loss to the Habs. Time will show, but the money will be the same. Jagr finally scored and after the game commented how well the Sabres offensively found the holes in the Rangers defense said, "I would love to play for Buffalo." Hopeful foreshadowing with two days left to the draft deadline, Mr. Jaromir will almost definitely remain a Ranger for now. The off-season is another story as Jags will most likely find a new home for his future hockey days. 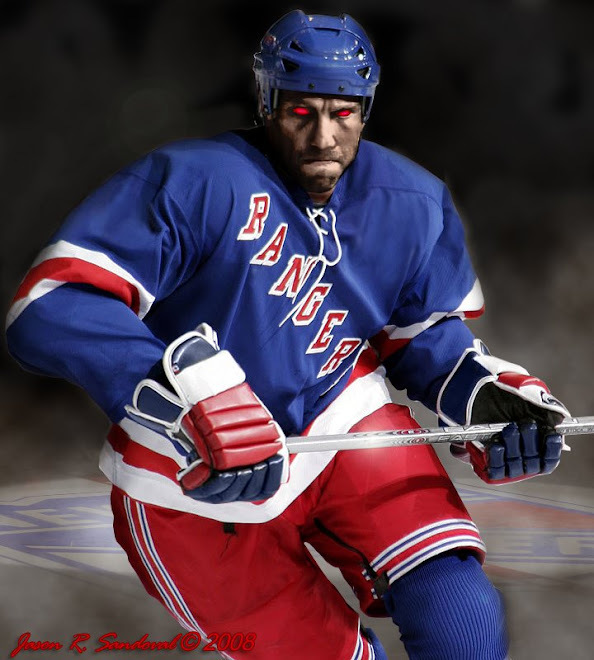 The Dark Ranger will happily thank Jags for revitalizing the Rangers organization post-lockout for a couple of years, shed one tear and look forward to the naming of a new Captain. You guessed it....Chris Drury. Speaking of Drury and as would be expected, this was the first game against Buffalo in Buffalo for Chris Drury after becoming a NY Ranger -- so a large 'boo' rang through his former home crowd announcing the starting lineup, Renney choosing to start his line for this very reason. Every time he touched the puck, the crowd booed him....only making Sean Avery jealous of all that attention! Tonight against the Florida Panthers at 7PM EST -- should be a 'win', but remember that we all know nothing. "I know Danny's [return] didn't work out too good but "Dru' sounds a lot like "boo,'' Drury, the ex-Buffalo captain, joked after the Rangers' pregame skate.